(amudhanAr) says that our prApyam (destiny) is the divine feet of emperumAnAr who does not have affinity toward anything other than the divine feet of thoNdaradippodi AzhvAr. enakku vERu gathi – is specially my destiny/goal. senthamizhil peyyum maRaith thamizh mAlaiyum – Unlike the great vEdhas that are only eligible for three varNas (sets of people), this (AzhvAr’s prabandham) is easily understood by lay persons and is eligible for everyone; uses words that are congruent and so removes any confusion; unlike (vedhAs that) give room for misunderstanding, this AzhvAr’s prabandham helps understand the most accurate and truthful meaning that is written in well-describing thamizh, as if the prabandham can be called as vEdham by itself; such is this AzhvAr’s prabandham that is a thamizh garland, called “thirumAlai”. Here ‘peyyum’ is a key word, to mean ‘to make (in a suitable/natural way)’ (mUda nei ‘peidhu’ in thiruppAvai). (aiyyan) and as said in “mAthA pithA bhrAthA nivAsassh saraNam suhrudh gathi:” (~nArAyaNan is all the relationships), and in “pithAsilOkasya charAcharasya” (~you are the lord for everyone in the world), and in “pitha bhrAthA cha mathA cha mAdhava:” (mAdhavan is all the relationships), and in “thAyayth thanthaiyAy [thiruvAimozhi 2-3-2, and 7-8-1]” (~as a mother and father), and so on can be said about his all-pervading relationship with us, is the one in sleeping position in kOyil (thiruvarangam), that is periya perumAL. Azhvar too in his prabandham said the same words ‘aiyanE aranganE [thirumAlai – 33]’. arangaththu aiyyan – emperumAn has got such an affinity to this place, that he identifies himself by the name of the place. paran – to such AzhvAr who is qualified as the pinnacle of subservience to emperumAn, such that it can be said there is no body above such level; such srI thoNdaradippodi AzhvAr; he too prayed to emperumAn “thoNdaradippodi ennum adiyanai aLiyan enRu aruLi un adiyArkku AtpadhuththAi [thiruppaLLiyezhuchchi – 10]” (~bear with this simpleton named thoNdaradippodi (dust of the divine feet of your devotees), and make me serve your devotees). 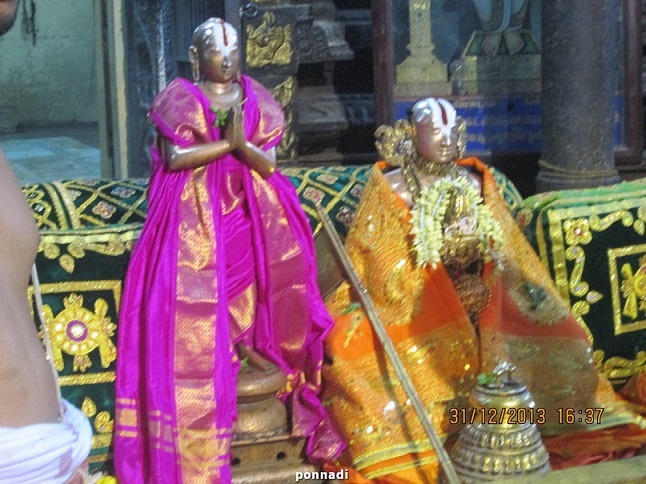 AdhariyA meyyan – He (emperumAnAr) does not appreciate those who use other means, such a truth seeker; says only whatever he saw through the sAsthras about emperumAn, being such truthful; as his divine bed he has been seeing the nature, form, and wealth of emperumAn, and now as an incarnation, he has truthfully provided such details in his srI bhAshyam; so he is referring to him as ‘meyyan’. charaNE gathi vERu enakkE – With the ‘E’ when referring to his divine feet, it talks about ananya gathithvam (no other destination). seyyum – (makes) thoNdaradippodi AzhvAr made two types of garlands – thiruththuzhAi garland, and thamizh garland. ANdAL too; but she gave flower garland that was made by her father; here AzhvAr is making the garland himself; so ‘seyyum’. Whereas amudhanar said earlier that poigai AzhvAr combined the meanings of vEdhas and thamizh (onRath thiriththu), and pAN perumAL gave the meanings of the four vEdhas in noble thamizh (nAn maRaich chemporuL senthamizhAl aLiththa), here amudhanar is saying thoNdaradippodi AzhvAr gave the prabandham as if vEdhas became thamizh itself. aiyan – In the prabandham of thirumAlai, periyavAchchAn piLLai gave vyAkyAnam for this word as, emperumAn being a natural relative. emperumAn is the pinnacle of sEshithvam (lord) – identification for that are his chankam (conch), and chakram (disc); thoNdaradippodi AzhvAr is the pinnacle of sEshathvam (servitude) – identification for that is his thiruththuzhAi basket. So, prApyam (destiny) of thiruththuzhAi AzhvAr is arangaththu aiyan‘s divine feet; for thoNdaradippodi AzhvAr who places that garland, destiny is the divine feet of devotees who are happy to see AzhvAr doing kainkaryam to thiruththuAzhAi AzhvAr (for making it reach emperumAn‘s divine feet); emperumAnAr‘s destiny is this paran’s, that is AzhvAr‘s divine feet; amudhanAr‘s destiny is the AchArya emperumAnAr‘s divine feet. This entry was posted in iyaRpA, rAmAnusa nURRanthAdhi and tagged 4000, adippodi, azhvar, azhwar, dhivya, divya, english, introduction, iramanusa, jeeyar, jIyar, maalai, malai, meanings, naalayira, naalayiram, nurrandhadhi, nurranthadhi, nutrandadi, nutrandhadhi, nutranthadhi, prabandham, ramanuja, ramanujar, ramanusa, thiruvarangathu amudhanar, thondar, vyakyanam on November 2, 2015 by raghuram.